White Sandy Beach, Bird Watching, Dolphins, Sunsets and Sunrises As you Vacation and Relax At The Beach. Password protected WIFI and HDTV makes your stay more like home. Across the street are nice places to eat and good shopping. Take a boat trip from the marina and enjoy the dolphin and beautiful sunsets. We moved to Esteo over 13 years ago from northern Indiana and enjoy the beaches and beautiful weather. We have two children, 4 grandchildren and 5 great grandchildren who all love to come and visit and enjoy the wonderful beach. The condo is beautiful, very clean and people return year after year. 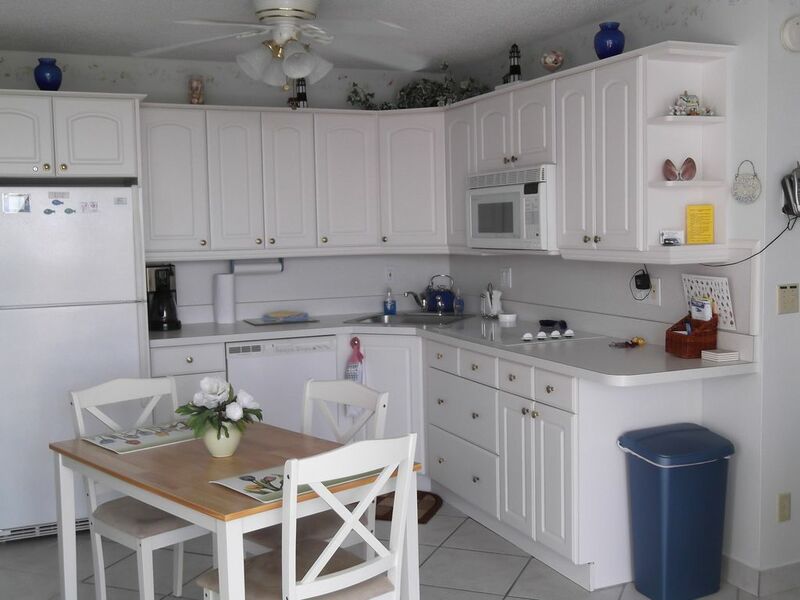 It is nonsmoking and no pets..
A great view of the gulf and watch the birds and dolphins play. We enjoyed our stay. First time we had been to Fort Meyers Beach but will definitely be back. Our stay was only a week and that was not long enough. Next time, we will stay longer. Loved the unit. Very comfortable and quiet. We needed a place where we could just relax and unwind. It was perfect. Very nice place. Everything you need. What a Fantastic Condo! It's beautiful ! Super clean, bright, comfortable and modern. It's packed with everything you would need. The modern relaxing colors are fantastic. Even the bedding is new and fresh and beautiful. The condo is on the east side of the building and the view is still awesome!!!! It was very quiet and cool and did I mention super clean. Tons of towel, beach chairs and toys, even hair spay and tanning lotion. I felt so at home and I cant wait to come back. The owners are a wonderful couple and very, very pleasant to book with. Thank you very much for making my vacation fabulous. My warmest regards to Cliff and Margaret. Thanks Ramona Lee for your great review. We always love having you come and enjoy time in our condo at beautiful Fort Myers Beach. We love to share our vacation home with nice people like you. Lovely apartment in great location. Just spent 2 fantastic relaxing weeks in apartment 501B, the location directly on the beach was excellent. The apartment had everything you could need for a beach stay including beach chairs and beach umbrella. The fully functional kitchen included dishwasher and large fridge / freezer allowing you to eat in if required. Large comfortable king size bed ensured a great nights sleep. The beach was fantastic and we regularly spotted dolphins. Overall fantastic apartment and location and will definitely be my first choice when we return to Estero Beach and Tennis Club. We are so glad you enjoyed your vacation at Estero Beach & Tennis and Tennis Club 501 B on Fort Myers Beach. Yes this a piece of paradise and a great place to relax and go home with good memories of your beach vacation. Very nice and clean! Everything you need is there!! So good to see you again. Glad you can come again next year to relax and enjoy the beach! We have stayed at the condo owned by Margaret & Cliff Clouser 7 times and we hope to return again next year and for many years to come. We have always found it comfortable, quiet, and well-maintained. The kitchen is fully stocked with cookware and dishes and everything is clean and works well. The living area is comfortable, with a pull-out sofabed that faces the TV (cable provided, along with wi-fi), a comfortable recliner, a glass coffee table and an eating table. The bedroom has a wonderful king-size bed with a new mattress & box springs. The larger bathroom is great - plenty of closet space. There are pool toys, beach chairs, towels, umbrellas, beach bags. Everything you could need it for a beach vacation is here! We love the building because it is quiet and secure. The grounds are beautifully maintained. The building is a short walk across the grassy lawn to the beautiful beach. Parking in the secure lot is plentiful and that's something to be grateful for during high season. A strip mall across the street has shops and restaurants. Margaret & Cliff are very responsive and accommodating. We love their condo! It is always nice to have you in our condo and so glad you had a great vacation. Marina, Shopping, Restaurants, CVS, Trolley to all of Fort Myers Beach and Lover's Key State Park. All Cancellations shall be subject to a minimum $40 administrative charge. Deposits will be forfeited unless written cancellation notice is received at least 60 days prior to your arrival. Should it be necessary to cancel after you have paid in full, all prepaid amounts will be retained as liquidated damages unless the full term of your reservation is re-booked.